Problem: The b43 and bcma kernel modules do not get along. You'd never know this with kernels up to 3.2.14, as bcma is not automatically loaded and it is not needed with b43. For recent kernels however, it is. It in turn destroys wireless internet speeds. Solution: The broadcom-wl driver. It used to be portrayed in the Wiki as being something to avoid, but that has changed recently. It offers a better connection and much faster speeds, but can take a little bit more effort to set up. Just a bit. 1. Install broadcom-wl from the AUR. 2. Uninstall b43-firmware if it's installed. 3. Note what broadcom-wl has put into /etc/modprobe.d. These blacklistings will ensure no interference from other kernel modules. Also make sure you're not blacklisting `wl` or its friends, if you have been. (of course replacing <yourdevice> with the names of your interfaces - probably eth0 and wlan0) This will tell you their MAC addresses. Write these down! 6. Go change ANYTHING that had references to the old interface names. I had to change my rc.conf, as well as settings in my wicd preferences so that it knows what names to look for. 8. Save this page. Yes, the html. This is so that you still know what to do in case of problems and no internet. 9. Reboot and enjoy your restored wireless internet. Seems everybody and their grandmothers are having internet problems since 3.3. On a Macbook Pro, kernel 3.3.2-1. I made that image before checking the forums, but now that I've looked around I suspect the kernel. Put up with it until 3.3.3? Or regress? Downgraded kernel to 3.2.14 and nvidia drivers too, and now everything is back to normal. Note that nvidia-295.33-2 has the 3.3 kernel as a dependency, but 295.33-1 does not. Be careful. Also, you may have dependency conflicts other than nvidia. I did not. Good luck! Reopened and bumped this on 2012 July 14. After months of waiting and holding back my kernel I decided to try again to see if the problem would fix itself. We are now at kernel 3.4.4-2 and still nothing. * My wireless card is the `BCM4322`. I even rebuilt the b43 firmware after the kernel upgrade, but that didn't help anything. I can't _seriously_ be the only MBP user to experience this slow-as-molasses wireless speed, can I? b43 still works great when downgrading to 3.3.8, but you can't stay there forever.. Thank you. At least now I know I'm not alone. I was never able to move off of 3.2.14... this is curious. Why was your b43 still in good shape up to 3.3.8, but not now all of a sudden? You'd think the kernel update process itself is at fault, which is often the case, but even rebuilding b43 after a kernel update doesn't help the problem. I don't want to stay on 3.2.14 forever because that lags back the nvidia drivers as well. Take a look at my MODULES line. I did an experiment by removing `b43` from there and restarting. It didn't affect my connection or speed at all. Could the kernel be loading some different module? ...and now suddenly internet speeds are back to normal. ...and are destroyed again when this pops up. Some digging around has shown that people have losing bluetooth and their wireless connection (performance) because of this since 2008. After various tests I'm beginning to think that the `GPE storm` is not the culprit. However, I have noticed that the kernel seems to be loading modules regardless of my rc.conf. and a quite check to `lsmod` confirms that they're loaded. And giving everything a shutdown, then restart, I find that the loaded modules are exactly the same. Then, could the kernel being loading an incorrect module for my wireless? The wiki says: "MODULES: Modules to load at boot-up in addition to auto-loaded ones"
So I guess udev autoloads b43 anyway. According to this page: http://linuxwireless.org/en/users/Drivers/b43, b43 is the right one. I also noticed that GPE storm thing, but it appears quite random and I don't think it affects my wireless performance. My dmesg contains that only once. 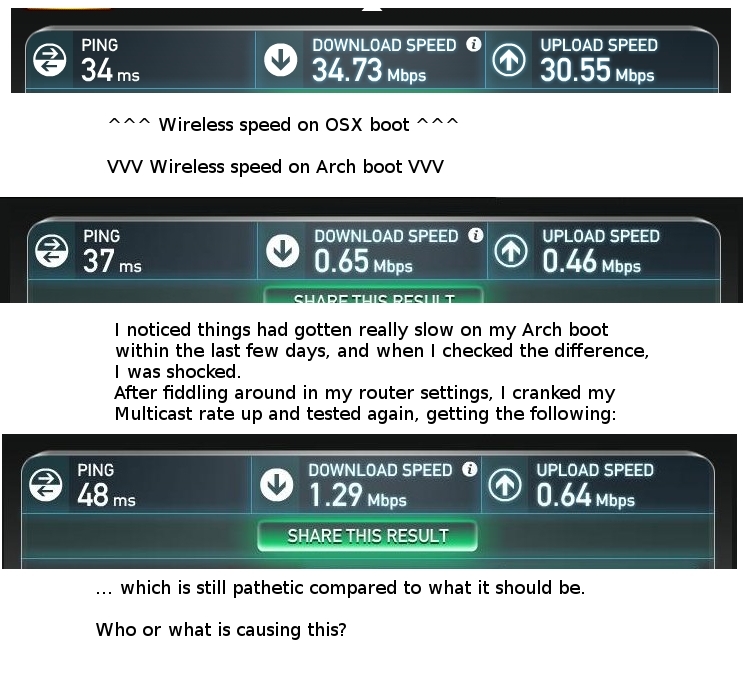 After all, the wireless performance varies a lot and I find it difficult to tell if something helps or the improvements are completely random. It isn't. Some bluetooth implementations cause havoc with 802.11. Can you try an 802.11 N network rather than a G ? If these numbers look reasonable, the problem could be at the higher protocol layers. @tullius How did you personally disable bluetooth? retry = 92 = bad? [ 1072.839997] ieee80211 phy0: wlan0: No probe response from AP 4c:e6:76:22:4f:33 after 500ms, disconnecting. Again, everything was fine with kernel < 3.4. (downgrading helps). Holy mother of dropped packets! Also, I've been quite curious as to why the kernel versions that kill our respective wirelesses are different. You should blakclist brcmsmac, b43, ssb and bcma. Then modprobe wl in /etc/rc.local (because there is a chance of a kernel panic if brcmsmac loads wl or the other way around). b43 combined with the some of the "official" kernel modules, like brcmsmac, ssb or bcma, create these kinds of problems. This driver is more likely to cause problems than to resolve them. Most of the problems reported by users on Broadcom chips are caused by this driver. Using this is HIGHLY NOT recommended. Before you even think of trying out this one, make sure to try the other drivers first. I used broadcom-wl some time ago, and it was horrible. But still, the wiki does make it very clear that broadcom-wl is bad, and I feel safer heeding its advice. Well, guess I'll blacklist the hell out of everything and give broadcom-wl a shot. Worse comes to worse I just switch back. It _is_ the proprietary driver, after all. You'd think it would work. After installing broadcom-wl the wireless performance is pretty good. However, it tends to loose connection every 5 minutes or so. Did you do all the blacklisting you had to? Tried out broadcom-wl, blacklisted everything, but on a power-down and reboot it wouldn't detect wireless networks. The "interface flipping" might have been occurring as well. Back on b43, and every once and a while I get normal speeds. After a bit of use it slows right down though. Maybe it's power management after all? I cannot check if the speed is ok on kernels older than 3.4, but I just notice with speedtest.net that the speed tends to jump from 15mbps (how it should be) to 1mbps (only on linux). Unfortunately, most of the time the speed is low. I do not have any clueful kernel messages though. Thank you for reporting this. As with tulius, it's good to know we're not alone with this problem. broadcom-wl works flawlessly though, without any disconnects, I'm using it for a while already. Just needed to updated some udev rules, cause the wireless interface appeared as eth1 instead of wlan0.